Actors and actresses--Correspondence, reminiscences, etc. 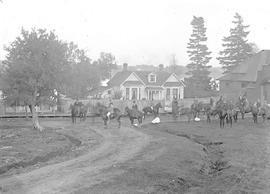 A group of fox hunters at the gate to the guard house to Work Point, Victoria. Recreational film. 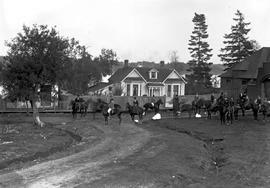 In the final film completed by pioneer BC filmmaker A.D. "Cowboy" Kean, the Toronto-North York Hunt club is seen on a fox hunt in Ontario's Humber Valley. Group of men and women gathered on steps before the starting of a fox hunt; Dunsmuir family may be participating.